Bend, the fastest growing city in Central Oregon, is not named for the bend in the Deschutes River. 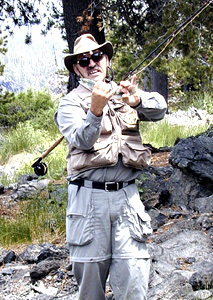 No, it's actually named for the BEND in your rod when you hook one of the local wild redsides, browns, brookies, steelhead, salmon or, God forbid, a muscular white fish. Now that several PFF'ers have relocated to the smog-free English-speaking area, we are really beginning to enjoy the fruits of local fishing. Dave Black and I traveled fifty minutes to East Lake in late June. Dave wanted to tryout his new sixteen foot Tracker boat that has casting platforms fore and aft and all the other goodies. We hadn't left the dock but one-hundred feet when I landed a nice fourteen inch rainbow. Another one-hundred-and-fifty feet and another rainbow. Then Dave got hot and started banging rainbows, most of them in the ten to fourteen inch range. We trolled by the rock wall on the north side of the lake and each of us landed about twenty in the same size. For every one we landed and released we missed at least three or four. Finally it slowed down so we switched from wooly buggers (olive-green and black with gold bead-heads) to dry flies. We pulled up into a little cove on the east side of the lake. Between wind gusts we promptly landed thirty or more eachundefinedrainbows, browns, brookies and Atlantic salmon...oh yeah... and a couple of white fish/chubbs thrown in. I think we had a "hat trick" in species. We got on the water around 8:30 AM and by around 2:00 PM we were just toooooo tired to fish any more. Just another hundred fish day! Ah, fly fishing Oregon .... WHAT A WAY TO GO! Both of us with more than fifty fish. We missed at least twice as many! Thought we'd died and gone to heaven! We pulled back into the dock, where Dave professionally backed his truck with trailer down to pick up the boat. While balancing on the trailer frame he decided to do a backward swan dive into the lake. I think Dave just needed to cool off from all the hot fishing!